Mountain biking indoors? Only in Cleveland, Ohio. (And soon, in Milwaukee, Wisconsin) I read and article and watched a video of a Harry Hart, a Yahoo writer that tried “indoor mountain biking” (isn’t that a oxymoran). Ray’s Indoor Mountain Bike Park looks a bit like Rob Drydeks’ Fantasy Factory and features a series of ramps and jumps designed to simulate “mountain” biking. It’s an interesting novelty for kids just getting started on BMX bikes or for those with extra cash that don’t want to risk getting their bikes wet in the snow. But for seasoned mountain bikers, the Chicago area forest preserves have shown recent evidence of diehard bikers riding in the snow. And isn’t that what mountain biking really is all about? Riding outside on hills and mountains? For those that want to stay dry and risk crashing into hard wooden platforms versus soft snow (and possibly stones and roots under the snow), check out Ray’s! 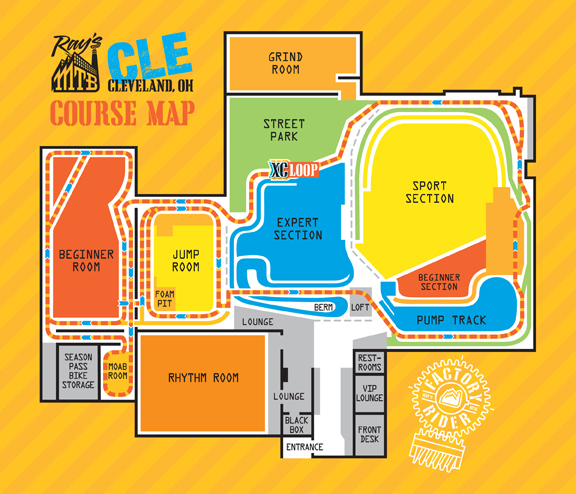 Check out the Course of Ray’s Indoor Mountain Bike Park. From a safety perspective (and from personal experience of my hands and knees hitting hard surfaces), all that wood looks not so inviting. I prefer dirt myself. But then I do fall at times! I also notice there is A LOT of info on Ray’s site about waivers. Almost as much as a skydiving site. Kinda tells you something about the safety factor of the indoor course, doesn’t it? Prices can be found here and rules can be found here. For a one-time visit it costs about $20-24. For a Season’s pass, it’s a mere $378. The School of Ray’s also offers mountain bike classes, from basic to advanced on mountain and BMX biking. For learning purposes I can see how an indoor course might be useful. But then again, in the learning phase, I’d like to see more foam padding and less wood around the edges! For breaking news about Ray’s Milwaukee location coming soon, click here.